Three-in-one today. 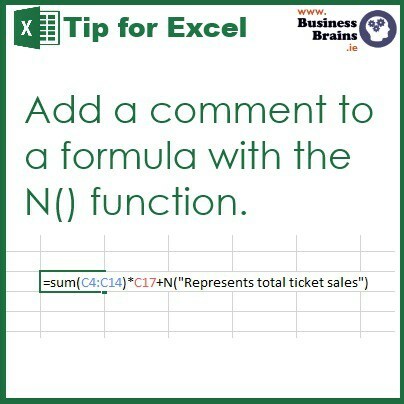 That’s right, today you will discover one shortcut to add a comment to an Excel formula, discover how to use the N() function to add a comment and learn about N(). 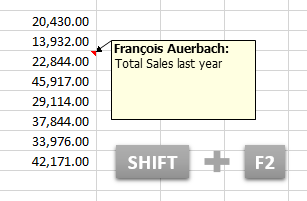 Using comments provides potential users -and yourself- with additional information about the data which is shown. It’s good practice to document your work and it makes a worksheet easier to understand. Head over to the Review tab and click New Comment or press SHIFT+F2. A yellow sticky pops up and you can type your comment there. A red triangle in the corner of the cell indicates that a comment is attached to that cell. Fine. You don’t necessarily want users to see that you have comments in your spreadsheet, yet you might want to be able to retrace your steps yourself. In that case, the N() function could be a good alternative. Also, if you apply protection to the sheet, there is no way users will see that one. What’s the N() function anyway? 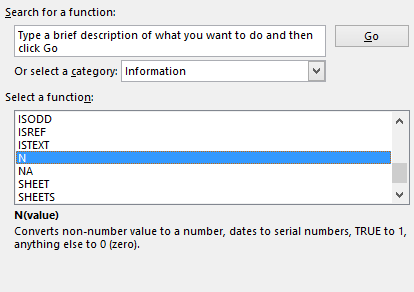 Found in the Information category of functions, N converts ‘stuff’ to numbers or to zeros (it’s all explained in the next picture). Quite handy when the result of your AND, your IF or your SUMPRODUCT array gives you something you can’t use inside another formula. When you add zero to a number, it doesn’t change the result. Nifty, eh? Try it and let me know what you think. Go on. You can start and do some real work after that.